This story first appeared in The Altavista Journal. 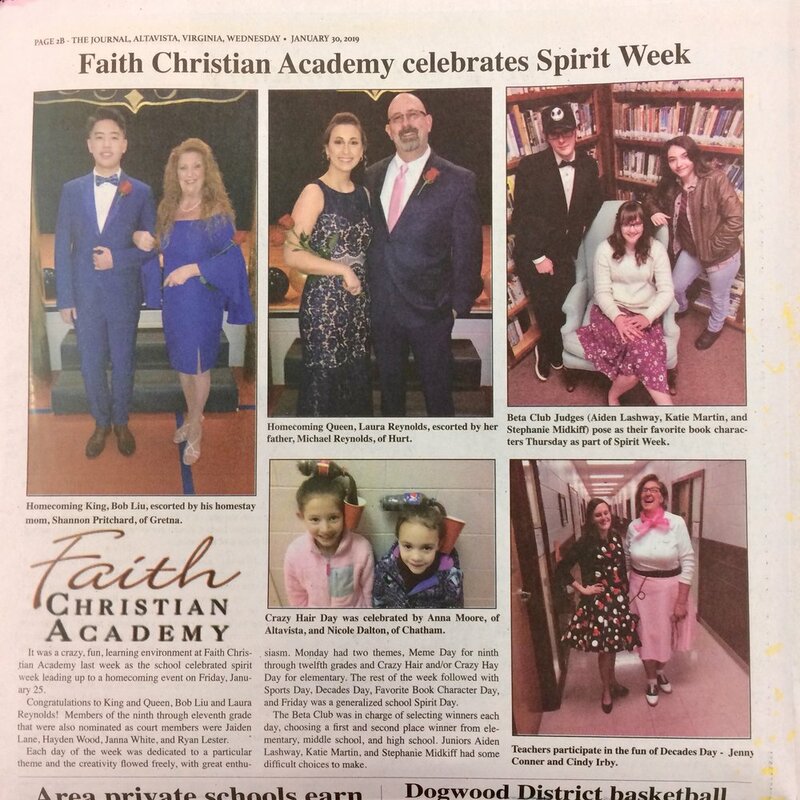 It was a crazy, fun learning environment at Faith Christian Academy last week as the school celebrated Spirit Week leading up to a homecoming event on Friday, January 25. Congratulations to King and Queen, Bob Liu and Laura Reynolds! Members of the ninth through eleventh grade that were also nominated as court members were Jaiden Lane, Hayden Wood, Janna White, and Ryan Lester. Each day of the week was dedicated to a particular theme and the creativity flowed freely, with great enthusiasm. Monday had two themes, Meme Day for ninth through twelfth grades and Crazy Hair and/or Crazy Hay Day for elementary. The rest of the week followed with Sports Day, Decades Day, Favorite Book Character Day, and Friday was a generalized school Spirit Day. The Beta Club was in charge of selecting winners each day, choosing a first and second place winner from elementary, middle school, and high school. Juniors Aiden Lashway, Katie Martin, and Stephanie Midkiff had some difficult choices to make.